Watching various comments on multiple diabetes websites and pages I’m often taken aback by how it seems the majority of commenters feel about their disease. It sort of struck me anew yesterday when I realized I was reading a thread full of comments that were commiserations about how difficult and isolating life with diabetes is. I started thinking about how often I’ve said (a few times) and thought (many many more times): “but you don’t know how it feels to be ___(fill in a BG of your choice).” I have a doctor’s appointment later in the week so my doctor is on my brain; she doesn’t have diabetes and I wonder how many times she has received this sort of comment from a patient. I know I’ve said it to my husband. Friends have asked me through the years, and you probably know as well as I just how difficult it is to explain what a high or a low really feels like, from the inside. I know I’ve thought of my blood glucose levels when clients complain about being too tired to work out, or when coworkers say they were out late. I wonder what they’d say if their CGM was alarming through the night and they couldn’t get their BG up or down to a safe and restful level. Because, at the same time, I’ve had clients report they couldn’t work out due to a migraine. I’ve seen coworkers barricade themselves in a dark office and put their heads down on a desk to try and stave off a migraine attack; I don’t know more than a headache. I don’t have arthritic bones that ache. I don’t have joints that have never quite worked right, without pain. I don’t wear dentures or have a metal screw in any of my bones. I don’t have food allergies that make me quiz a restaurant before I go, before I order, and face a plate I’m not quite sure will send me to the ER. I’m not allergic to bee stings or poison oak that make me fearful of being outdoors. I mention all of these, because I’m not sure if feeling a high or low blood sugar from the inside is what counts for someone to comprehend or commiserate or celebrate about life with diabetes. This isn’t to say that I don’t love hanging out with my diabetes peeps; the shorthand is amazing and fills me with a peace I don’t find anyplace else. However, I don’t think it’s right to automatically disqualify others from my life with diabetes because they don’t know how it feels to be a certain BG level. I just need them to know that I’m trying, every day, and some days it works and some days it doesn’t. I need them to understand that for me, a number matters. A level changes my physical energy, can drain my strength, and can make me question my actions on a level of self-analysis of my body most don’t reach. I need them to respect that it is an isolating feeling to look around at people who aren’t counting, who aren’t calculating, who are biting into random food without, it seems, a care in the world. Once I trust that they understand these things about me, I feel pretty safe with them. I never really know what I’m going to blog about. Sometimes I wait for inspiration, and every day suspect maybe it won’t come. Like today, for instance…until I remembered a funny thing that I’ll say I’m blogging about but really it’s just a funny story and hope you enjoy it. My mom’s birthday was Friday (in case you missed it; don’t worry I signed your name to the card) and my parents and my husband and I went out to dinner on Saturday. We went to a fancy little place that was fun to try for a special occasion. They have a three-course prix fix menu… each of the courses has four options. Lucky for us, the chef sent out an amuse bouche after we ordered and before our first course arrived. YUM. Seriously; who would have thought that cold squash soup needed a few leaves of Brussels sprouts and three drops of maple syrup? Sounds disgusting but was delicious. And then after the entrée the waiter comes out with some sort of little drink for us—it was some sort of milkshakey cinnamon sugar sort of thing. I’m not sure what it was called, but let me tell you: WOAH was it sweet. I took one sip (of the two sips in the glass) and handed it off. And we’re still all chatting along, talking about our days, and my dad asks me what my next course is. I had just been talking about where I ran that morning, so presumed he meant where I would next be running an organized race. I start telling him all about all of my plans for the next few months… and because he’s my dad, he lets me keep going until I’m done. Cheese course. And, I didn’t mean it; it was just a really sweet drink, Dad! I thought it was funny. Maybe you had to be there. 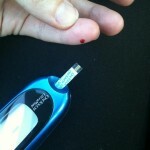 It’s just not something that someone who doesn’t have diabetes would even think about, so I thought I’d share it today. Posted in Living with Type 1 Diabetes, Random Musings, Uncategorized, Weight, Weight, Don't Tell Me-- Does it have to do with what I eat? I’ve had some comments appear in my various inboxes over the past few years about how unusually positive Diabetes Outside is, by comparison. I appreciate that very much, yet at the same time get frustrated that somehow positivity is unusual in diabetes circles. I am not super sure I should be writing about this particular topic, as it’s definitely one close to everyone’s heart, but I feel like I’m avoiding it if I don’t discuss it at all. Can’t have that. Together, fear and worry represented 56% of the people who answered the poll. Fifty-six percent! This may mean I don’t sleep well tonight. At the bottom of the poll, 3% of the respondents answered “hope” is their prevailing emotion when they think about their diabetes and their future. Only 2% answered: acceptance, optimism, faith. Those options didn’t even make the cutoff on the display screen! Wow. This means that at least half of you are still in the shadow of that monster. And you know what? If you are, I think you are selling yourself incredibly short. Listen, I’m the last one to tell you it’s easy to accept diabetes. I’ve worked at it, and will probably continue to work at it the rest of my life. Diabetes isn’t an easy thing to do. The disease carries with it an enormous responsibility and not much of a cushion for mistakes. You don’t get to take a day away… it’s hard to even take a few hours away from calculating and figuring and planning and talking and thinking. This is why I think acceptance is just so much easier than anything else. Because the thing is? You stop TRYING to get away from it. You see diabetes isn’t the worst thing in the world. You don’t feel like a failure before you get up in the morning simply because you have woken up in the shadow of a monster. I want you to work at accepting your life with your diabetes. Let the monster go. You’ve got better things to do here. There is nothing else, really, that I can say for myself at this moment. I am riveted to the image my mom emailed. 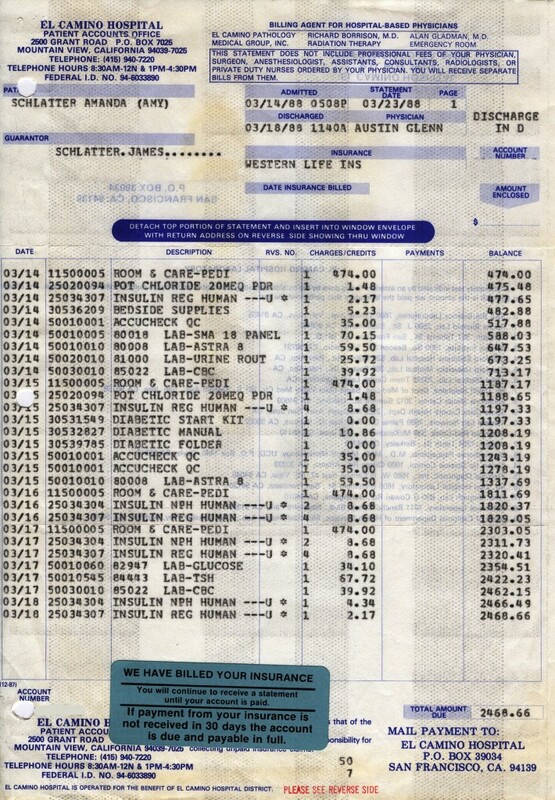 It’s the hospital bill from March, 1988. First: a four day stay cost $2,468.66. (Are you JOKING?!) What a steal of a deal. Second: that includes TWO of those nasty potassium drinks, omg. Blech. I can’t believe that cost only $1.48. I’d pay a hundred times that to NOT drink it. Blech. Shudder. Third: awww, my first blood checks!!! Each one cost $35. Fourth: they charged for a diabetic start kit. What is that. 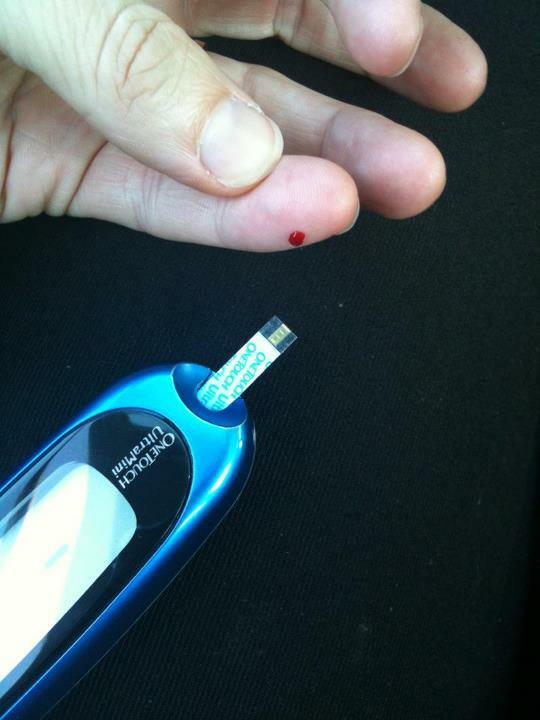 Fifth: awww, my first insulin shot!!! Regular. Aww. Amy (age 10) was diagnosed as diabetic and spent last week in the hospital until they stabilized her blood glucose level with insulin. She is back to a normal lifestyle now, except she has to analyze 4 blood samples and give herself 2 insulin injections every day. We all have appreciated the concern and support of [his coworkers]. It’s just so, so, I don’t know, cute and captures a lot. A lot of how little we knew, I guess. I was a very sick little girl. This bill shows me just how sick, and is a great little reminder of how far I’ve come (and how much I heart insulin). Aw, I just think it’s fun to see. AND, it’s helping me get that medal. In case you didn’t know… I’m a sucker for a medal. I will get up at 3am Florida time, stand around in 28 degree weather for an hour wearing a trash bag, and then run for four and a half hours including some of that through Animal Kingdom smells like you wouldn’t believe, slip on water that has frozen into ice on the ground at water stops, endure burning quad muscles for the last hour, and then stand around for another hour after I got to stop running in my sweaty clothes for one. I’ll then turn around and sign up to do half of that all over again in southern California just to get a Super Coast to Coast Medal because I did them both in the same year. I’ll run a 10k and have thirty seconds to change shoes and bib number before starting a 5k just to get one. I’ll drive around with twelve people for three days I’ve never met before just to get one. But there is one, one very special medal, that I haven’t earned and can’t earn. Yes, I’ve blogged about it before, and I’m certain I’ll do it again. I am very much looking forward to this medal. You guessed it! It’s the Joslin 50 years with Type One Diabetes medal. Once I qualify for that certificate, I’m on my way to my medal. I wonder what all will happen before I earn that beauty? I should start shopping for a shadowbox or something for it now… it’ll take me forever to find just the perfect spot. It’s way more important than any of my other medals. I mean, I’ve earned them all, and I love them all in their individual ways, but this Joslin medal… woah. Check it out. You’ve got to send documentation and stuff, so get going on collecting and saving what you will need. Certificates for anyone 25-49 years on insulin, then medals at 50 and 75 years. I mean, haven’t we all said at one point or another that we deserve a medal for this? Thanks to Joslin for recognizing that, and us, and all we do. This is fun! I often wonder about those of you who were diagnosed as a teen or later in your life—when you were old enough to have clear memories of Life Before Diagnosis and Life After Diagnosis. I think, generally, kids do a fine job of going with the flow after a diabetes diagnosis more than most people over the age of fifteen or so. I think the younger ones are still learning about and defining for themselves what the world even IS, such that anything new or any change is just added to the list of what else they learned that day, week, month, or year. I think it must have been harder for those diagnosed any time after the arbitrary age I just chose of fifteen years. Intellectually, yes, the carbohydrates and calculations and learning and basic nuts and bolts education is not the high wall that it will be for a younger kid, but the younger kid just won’t have the developed sense of identity that must be altered at diagnosis that an older person has. I think of a young woman I met a few years ago, who was on her way after high school graduation into the Air Force. Bam. Diagnosed with type one diabetes. I think of the champion distance runner and the handful of professional athletes who recognize only that their usual performance is suffering. Bam. Diagnosed with type one diabetes. Or the forty something established attorney who has been noticing a few things don’t feel right and sees his doctor. Bam. Diagnosed with type two diabetes… then, later… Bam. Diagnosed with type one diabetes. Or the sixty something grandmother who has been aging gracefully and gardening faithfully for years and after her annual lab work now sees it. Bam. Diagnosed with type two diabetes. For most of you who were diagnosed later, I can see how acceptance of your new diabetic life may be more difficult than someone who was diagnosed before they really were old enough to be on their own in the world. In a lot of ways, I guess I feel lucky that I don’t remember now what it was like to eat and not think about any of it, or not do a calculation or my energy expenditures or carry around a little calculator and be my own little Bolus Wizard. It’s just something I think about. Whenever I hear someone say that to or around me, I see a little orange flag pop up out of their heads. Because I think it’s the same thing as saying I’m Totally In Control of well, anything. And I think that is not possible or realistic. Which means, yes, that orange little flag popping out of their head? It’s a Denial Warning. Because the thing is, with diabetes? We really do have a serious medical condition. It really can take our lives away from us. We really can get into situations that are not good for us to be in, and we really will need help to get out of those situations. And this applies to every single one of us, no matter what our A1c is or how often we check our BGs or what we do and don’t eat, drink, or do. It’s the nature of life, and particularly life with diabetes. Respecting that is just something we need to do to really accept our disease. So when I hear someone say they are Totally In Control of Their Diabetes, it makes me wonder what deep down they really truly think. I suspect they have at least a thread of fear involved, that when challenged, raises the pitch and volume of their statements about Being in Control of Their Diabetes and encourages anyone around them to shut up. I’m not saying I like this aspect of life with diabetes; who would? I’m glad he was honest with me, and I’m glad he also gave me a different way of looking at the blanket ban on diabetics as commercial pilots. Ever since that moment, anytime someone has told me or I have read about something diabetics as a class are not permitted to do, I look at the other classes who also are refused. It becomes less about me proving something to the world and something more about the world simply functioning as best it can. Which is all I think any of us can do, with and without diabetes. Whatever control we fool ourselves into believing we have, I think it is a good idea to also follow that thread of fear and see where it leads us. If we follow it and it leads us scary places, spend a little time there. Feel it out. See if there is something you can do about it, and if not, acknowledge that it’s there, and leave it be. Fear itself is not something bad or something to be avoided. Management of our diabetes means taking both physical and emotional aspects of the disease in stride. We can’t control every day; that task would quickly take control of our lives. We just need to make the best decisions that we can make, each day, and take as great care of our bodies as possible. Releasing ourselves from the notion that we are ever completely in control is a smart thing to do, if you ask me. Do you consider yourself sick? Does anyone else? The plain and simple fact: I don’t consider myself sick, and I won’t put up with anyone who considers me sick because I have type one diabetes. I don’t feel like I run or work out to prove anything to anyone aside from myself. And that doesn’t have much to do with my disease—it has more to do with my weight in my early 20s and my (for lack of a better term) transformation through the years. My drive has become a major part of who I am. But you bet—if I’m in front of my bootcampers, I’m for sure going to do more pushups on my toes than I would do if I were in my living room! On the whole, I simply do not see what treating myself as if I am sick will get me. I try not to push myself over the edge, and have learned to listen to my body and give it a rest when it needs one… but that’s just being smart. It isn’t because I have diabetes. I’ve said it before and I’ll say it again: we all have things. Every single person on the planet. But it’s the people who are out there despite whatever things they’ve got going on that I think truly are a testament to the human spirit and what people are really capable of—if one is daring enough to try. 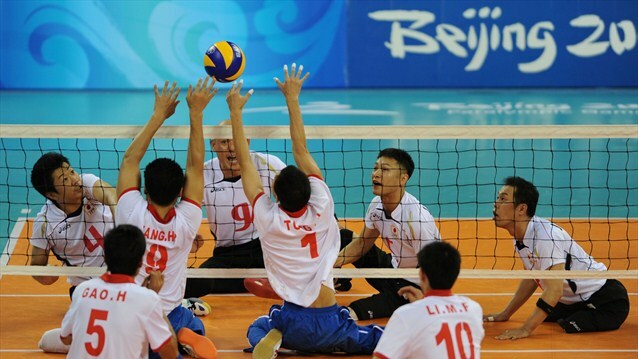 Facing the world as an Olympic hopeful or seasoned veteran? Running with one real leg and one artificial? Paralympians? 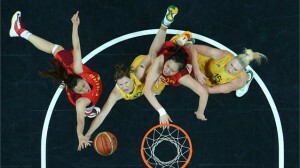 Check these athletes OUT. Everyone has something. Looking at these faces of these athletes, they are focused and determined and calculating what they need to do to succeed. It isn’t about feeling less than someone else. It isn’t about being sad or small or diminished. It’s about accomplishing their goals. It is perhaps why I can’t stand doctors’ waiting rooms. I sit there and am surrounded by others who appear and act sick and mopey and sad because they have diabetes. I don’t feel like I belong in that category and don’t want to be associated with them. Again, it’s just not my bag. When I’ve had a bad low, or several in a row, I’m exhausted. Yet it doesn’t stop me very much. I see people every day who don’t have diabetes and who give themselves rationales and excuses all the time, from sleeping poorly to eating something that didn’t agree with them. I wonder how they would react if they were diagnosed with diabetes, or if they had something that severely limited their ability to move without help, and they or their family started to see them as less than healthy. 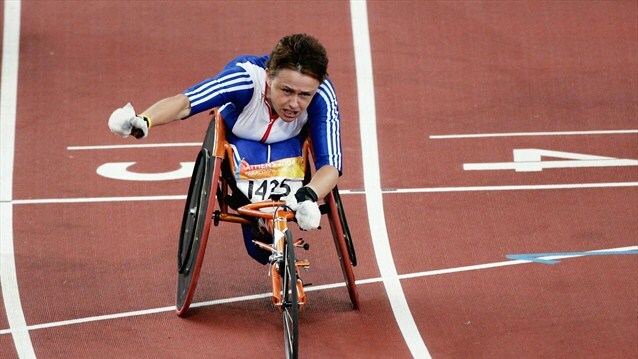 And then I turn to another extreme, in particular the Paralympians, and think: thank God. They can truly teach us all that being a champion has little to do with our physical things, and everything to do with something bigger and deeper. What fantastic athletes, every single one of them. My mom emailed me the other day and asked if I thought my skin had toughened after so many years with diabetes and the various taping involved in wearing a pump and CGM for the last…let’s see…carry the one…seventeen years. I don’t think my skin has toughened from tape; I think I have pretty tough skin as it is, compared to comments other people have made through the years. I have a hard time getting it to stick through sweat, etc. and that Mastisol stuff has truly been a life saver. I have no idea come to think of it where/how I heard about that stuff. I know one of the Minimed reps said he broke in a rash if I even mentioned “Mastisol”. Other people can use all sorts of tapes that don’t work for me– I know when I first went on the pump and had to use that bent needle thing with a piece of tape over it, that tape was awful. The tapes (actual tape dispenser medical tape stuff) just won’t stick to me. Or won’t stay stuck, or something. This has been a system I’ve spent years discovering what works! It’s funny you mention it today, though, since on [Saturday] today’s run I was feeling slightly claustrophobic just with my sensor on my arm– it has been on since I think Monday and the edges of the tape are unsticking slowly and annoyingly. And my site is on its third day, too, so I’m just ready to change them ALL! But, for example, I’m the only person I know who needs to put down Mastisol, and a serious tape Tegaderm, before I even put in the sensor. If I just go with the sensor and no tape like everyone at Minimed says I have to do, it will fall out. All of that said, if something happens and I have to take something off before the three days? Like, in that first day? OMG now THAT HURTS. I’d love to hear what works for you when it comes to sticking things on, or if you think your skin has changed based on your diabetes management!